DJ Wild from ELK Studios takes you right onto the dance floor in a nightclub. Join the fun and dance the night away with this game that celebrates electronic music and party nightlife. The neon-coloured symbols show DJ equipment, as well as some fruit symbols in a glass-style. The game doesn't have many features, but it allows for winning combinations in both directions and it offers re-spins with expanding wild symbols. Overall, the features of the game remind of the popular slot Starburst, but since this is an ELK game you can also play it with the betting strategies. The variance of the game is medium, and you may have some rounds without any winnings. 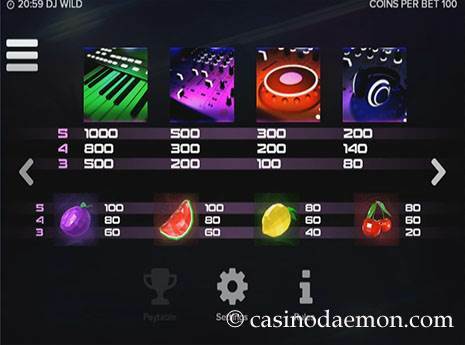 Most money can be worn with the expanding wild re-spins and you can also win a coin jackpot. This is a good game to play for just a few spins, or for a longer time, as the re-spins to trigger regularly and you probably won't have to wait for one for too long. The theoretical return to player is 96.3%, which is average for an online video slot. It is also possible to play DJ Wild mobile, as the game has been developed in HTML5 and is available for many mobile devices. 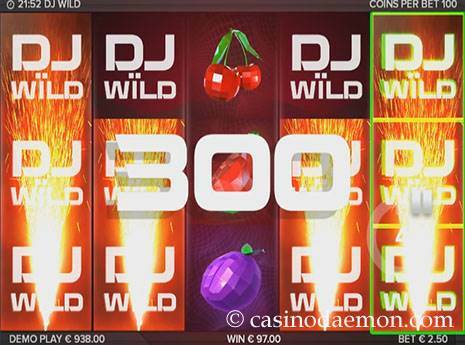 You can play DJ Wild for free on this page and try the game without obligation or having to register in a casino. If you like it, and want to try your luck for a chance to win some real money you can find it at one of the online casinos listed on this page. The slot has 10 pay-lines, but winning combinations are evaluated in both directions. In order to get a payout you need a minimum of three symbols either from left to right, or from right to left. This means, that the game has some great potential for huge winnings. When you get the DJ Wild symbol on the reels it will expand horizontally or vertically and trigger a free re-spin with the symbol held in place. If you get additional wild symbols during this re-spin, all wilds will be held on the screen and you will get yet another re-spin. This will continue until no further wilds are added, and the feature can lead to huge potential winnings! If you get the jackpot wild symbol on the middle reel you will win the DJ Wild jackpot. 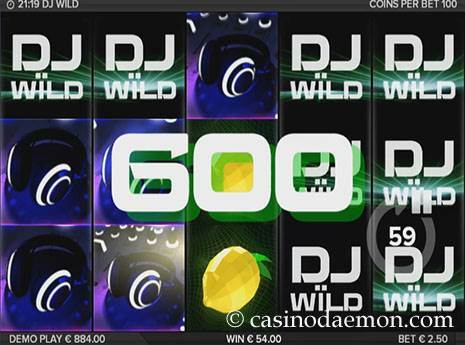 The DJ Wild slot has 5 reels with 20 pay-lines (10 each way) that is played with 100 coins per spin. 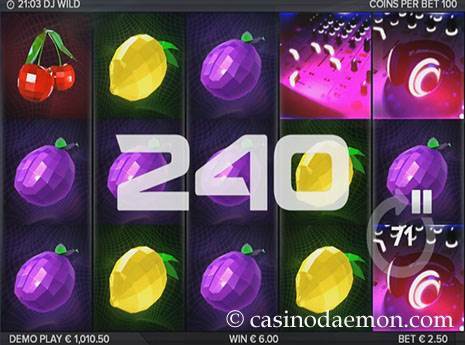 You can choose from total bet sizes between 0.25 and 100 £/$/€ per round, and you can also play the slot with automatic play options and betting strategies.